If you’ve been in the shop over the last few weeks, you may have noticed a few new faces! We’re so excited to now introduce Bogdan and Micah. Bogdan’s name auto-corrects to Bogan, so for a while, there was some doubling checking on his actual name. Jon and I did the interviewing together, and Micah’s interview was the first one where Jon had to leave me alone with the interviewee. He told me to proceed with the questions, so I asked Micah how she was with dogs. Following that, Jon hasn’t left me alone to interview any potential applicants. Micah & Bogdan have been working both in the shop and behind the scenes with packing orders and helping to get us organized in the back. It’s a bit surreal to have so many people bustling around compared to the days of our old tiny shop on the west end, when just me and Jon would fill the shop to capacity. It’s certainly been an adjustment for us to have so many people around, and it’s meant a bit of organizing on our end. We’ve been so used to it just being the two of us, which has meant that sometimes I leave my pens jumbled up with the shop pens, or Caleb’s toys mixed in with the merchandise so I guess it’s mostly me who needs to adjust. And, to everyone’s delight, Super has adjusted more quickly than we could’ve hoped for with having new people around to sniff and bark at and jump on. I suspect it’s mainly because he’s been getting treats from so many hands that don’t see each other, if you know what I mean. To be honest, I didn’t even think it was possible, but he’s gotten even more unruly in stealing food from the table. For years and years now, I’ve been trying to convince Jon that we need a cat. I know it seems like you’re either a dog or a cat person, but I kind of think I’m both. Jon has been holding off, citing my complete ignorance on the topic of raising a cat (like that’s ever stopped me from anything before, i.e. getting a dog, marrying him, becoming a teacher, opening a stationery shop, having a baby), as well as the fact that Super is not a fan of adult cats and racoons he meets on the street. However, in actual fact, it’s more that Super is not exactly the sharpest crayon in the box, and he just needs to some guidance when it comes to smaller furry creatures. I think the real problem is that Jon had some sort of traumatic event in his childhood involving an angry cat and since then has been convinced that the species is an unfriendly one, despite us having been in the homes of people who have both friendly and vaguely indifferent but at least non-threatening cats. I think it’s just that cats are very nimble and quick, which makes them sometimes appear a bit skittish, but which may also make them excellent mice-hunters. Last week, the stars aligned and Jon saw a mouse in the hall when he was taking out the garbage. And so Jon has relented on the cat, and we’ve been looking up some kittens from a few cat rescue places in Toronto. Soon enough we’ll have another beast in the shop, hopefully this time one that will be friendly enough to slink around the shop as customers browse. And hopefully it doesn’t run out the door – I mean, do cats do that?? It’s the end of another busy week, and it’s March. I can hardly believe all this snow we’ve had over the last few days, although I think temperatures are already starting to warm up. I was just complaining that we got these big snow boots for Caleb that he barely wore all winter since we barely had any snow (I’m not really complaining about that because a warm winter means significantly less risk to ink shipping, and you know, I’m not really a winter person). Now I’m complaining that these big snow boots we got for Caleb are now getting too small to fit on his giant feet. It’s really crazy how I bought them on sale on Boxing Day, which is the day after Christmas, and I bought them one size too big because I thought maybe he might grow just a bit or do up a double layer of socks in the bitter chill of Toronto, and now he and I are literally wrestling on couch trying to get these things on his feet. It really is wonderful to watch your business grow and thrive. Congratulations to you and Jon and to Bogdan and Micah. Thanks so much, Mark! It’s certainly been a crazy ride since the days of your first visits while we were on Dundas West, and of course, we really wouldn’t be here without folks like you and Erin, truly. You’re killing me here, Liz. I love cats. I now have 1 more reason to visit the shop more (not that I needed it). I know of some indoor kittens that love to attempt an escape through people’s legs at the door but the older cats don’t care about the allure of the outside world. I’ve seen a few bookshops with cats in them, and I feel like they must have been trained somehow – while we’re not directly on a street, it would be terrible to lose the cat! Meet Killer. My son’s cat who baby sits me occasionally. 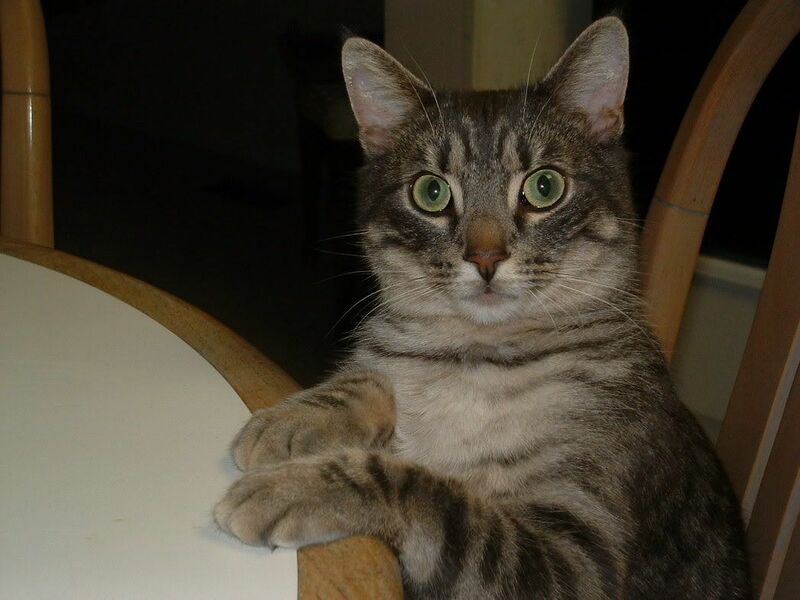 Jeff taught him table manners when he (the cat) was just a kitten. Notice his elbows are not on the table. I hope this works. @#>*/@ computers. Toss the letter in the recycling bin. It has been busy in Montreal too, albeit I think Toronto has stolen our winter Magic, or the snow is simply taking a break from our politics. As far as Calebs boots, save them for his brother or sister …to be. Interesting – sounds like expansion with new employees. Caution – do not expand too quickly . I know- not my business , but I advise people on their businesses – having worked my way up to the top of one for 18 years and then moved on to run my own for the past 19 years. I know aging myself… Be well and enjoy the cat . We own three. Do yourself a favour and acquire a Litter Locker system to compliment the litter box. Makes things a lot easier, more efficient when disposing..
We are hoping spring is around the corner, so we’re savouring the snow for now! We’ll certainly take your advice for both the business and the cat under consideration 🙂 Thanks so much for reading and taking the time to comment! If not I will fold my tent and silently steal away. Congrats to all from your friends in Windsor, ON. There is not a day goes by without a one WonderPen or another being found in my hands. Thanks so much! Always nice to hear from you 🙂 – and to hear that your pens are being put to good use!